Harold's Chicken Shack (also referred to as Harold's Chicken, or simply Harold's) is a chain of fried chicken restaurants located primarily in Chicago, Illinois. Harold's has been a notable part of Chicago's South Side culture and is known for its uniquely prepared chicken. Harold's Chicken is also available in Northwest Indiana; Cedar Rapids, Iowa; Iowa City, Iowa; Peoria, Illinois, and Momence, Illinois. The basic Harold's Chicken Shack dinner is a half or quarter chicken served with french fries, two pieces of white bread, and a cup of cole slaw. The chicken may be all white meat, all dark meat, or a mix (known as regular). Harold's also purveys wing dinners, livers, and gizzards, and some restaurants offer catfish, perch, and a number of side items including fried okra. The chicken can be served plain, but usually a sauce or seasoning is added. Popular choices include mild and hot sauces as well as lemon pepper seasoning. In Chicago-styled fried chicken, the sauce is drizzled over the chicken and fries which results in the chicken skin softening as it soaks up the sauce. Harold's fried chicken is different from that served at other fast food chicken restaurants (Kentucky Fried Chicken, Brown's Chicken, Popeyes, etc.) in two ways. The first is the cooking medium: Harold's chicken is cooked in a mix of half beef tallow and half vegetable oil, while most chains use only vegetable oil. This provides a taste that is closer to the traditional fried chicken that was invented in the American South. 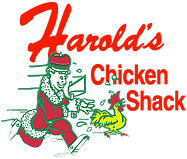 The second major difference between Harold's chicken and most other restaurants is that at Harold's, the chicken is not fried until it is ordered, while some chains fry their chicken in large batches and store it on warming racks until it is purchased. Harold Pierce set up a chain-wide policy from the beginning that all Harold's chicken would be cooked only after it was ordered, in order to preserve the freshly cooked taste of the chicken. Originally, this meant that there was a twelve to fifteen-minute wait between ordering the chicken and receiving it. However, the family has subsequently modified the original method: the chicken is partially fried beforehand, and then cooked to completion when it is ordered. This maintains the chicken's freshness while shortening the delivery time to seven or eight minutes. Harold Pierce differed from other fast food innovators in his development of the Harold's brand. He wanted each of his franchises to develop its own personality rather than forcing each to fit the same mold. This individuality continues today even as Harold's has expanded into other areas of Chicago. Some Harold's restaurants are very informal, with take-away chicken served by employees standing behind a window of bulletproof glass (originally introduced as a necessity rather than an aesthetic concern as Harold's often served some historically "rough" neighborhoods). Others offer a more welcoming environment, in which most of the clientele has the option to dine in. Harold's Chicken Shacks may or may not offer fountain drinks, additional menu items, catering services, or delivery. The only constants are the basic chicken dinners and the emblem of a cook chasing a chicken with a cleaver. Even this varies greatly, sometimes rendered in lights and sometimes hand-painted. Often, the cook is dressed like a King. Harold's restaurants are also referred to as "Harold's: The Fried Chicken King", which can be seen on many of the older South Side signs. Harold's Chicken Shack is a notable part of the culture of Chicago's South Side. The restaurant is often alluded to by the hip-hop community. The chain has been referenced by Kanye West, Common, Rhymefest, JUICE, G Herbo, Chance the Rapper, Freddie Gibbs, Lupe Fiasco and Dreezy. Rapper Wale stated in the song That Way, that Harold's Chicken was overrated. Top Dawg Entertainment rapper Kendrick Lamar mentioned Harold's Chicken in Fredo Santana’s song, "Jealous", in which Lamar is featured, where he claimed he loved it so much he flew a private jet there straight from Rome. Harold's has been shown in a scene on the television show Shameless, as well as part of the music video for BJ The Chicago Kid's "It's True". Harold's is also shown next to the bar visited early in the movie "Weird Science". ^ "The First Family of Fried Chicken" (PDF). Chicago Reader. 14 April 2006. pp. 1–2. Archived from the original (PDF) on 27 October 2016. Retrieved 29 April 2017. ^ "Chicago fried chicken chain coming to Corridor | The Gazette". The Gazette. Retrieved 27 October 2016. ^ Cooley, Will. "Moving On Out: Black Pioneering in Chicago, 1915-1950". Journal of Urban History. 36:4 (July 2010): 485–506. Chang, Bryan. "Chicken Wings: Hyde Park Vs Evanston"[permanent dead link]. Chicago Business 3 March 2005. Last accessed 20 November 2006. "Harold Pierce, 70, founder of Harold's Chicken Shacks". Chicago Sun-Times 11 March 1988. Heise, Kenan. "Chicken King Harold P. Pierce, 70". Chicago Tribune 11 March 1988. Abstract accessed 20 November 2006. Sula, Mike. "The First Family of Fried". The Chicago Reader 14 April 2006. Last accessed on 20 November 2006. Spivak, Caleb J. "Harold's Chicken and Ice Bar coming to Atlanta June 25" 14 June 2012.